Wells Fargo is and has been the best run big bank in the United States for some time now. While the stock is more expensive than its peers, it is a better operation and is still cheap on an absolute level. With the recent attractive acquisitions from GE Capital, Wells Fargo’s culture of cross-selling will make it a much more valuable franchise than it has been before. Wells Fargo (NYSE:WFC) is and has been the best run big bank in the United States for some time now. Its strength has led to superior shareholder and financial returns over the long term. The company combines the best deposit franchise with operating excellence, which is best exhibited through their cross-sell ratios that are the envy of the industry. Great companies try to improve themselves each and every day and Wells Fargo is a terrific example of that. While the CCAR process has been a nightmare for much of its competition, Wells Fargo has performed admirably offering consistent dividend increases and stock buybacks. Now the company is parlaying its top-notch balance sheet to make key strategic acquisitions, which will be a key conduit for future growth. While the stock is more expensive than its peers, it is a better operation and is still cheap on an absolute level. Banks are leveraged bets on the U.S. economy, particularly in key areas such as real estate, credit cards and auto loans. The big banks such as Wells Fargo have multiple levers, including brokerage, retirement, insurance, and trust businesses that can generate strong revenues in various economic environments. If you think about where the growth is coming from in the U.S. economy, Wells Fargo and the other banks are perfectly positioned. While low interest rates clearly hurt the overall earnings power of the franchise, due to the large impact that net interest income has on the income statement, they help other businesses such as mortgage origination. Banks can grow earnings through normal growth with loans and deposits, amongst other products, which are levered to the economy, and through efficiency gains. Wells Fargo is the furthest ahead in efficiency gains relative to its peers, but it still has the chance to outperform in winning its fair share of the market in its key markets. Also, Wells Fargo management has been astute enough to realize that there are very attractive assets on sale from General Electric (NYSE:GE), and it is taking advantage of its competitive position to add both attractive loans and clients, which can then be cross-sold across the franchise. Many people will say that there is a great risk of an economic recession or slower economic growth. There is no doubt that we will remain in a cyclical economic environment moving forward. With that said, it is important to keep in mind that we are barely growing as is. This has been a terrible economic recovery when you consider how deep the contraction was, particularly when you consider that historically the deeper the contraction the greater the recovery has been. One could argue many reasons for this, but I believe that time will show that a burdensome regulatory burden and anti-business policies have been a major contributor to this slow growth. There is a lot of upside in the U.S. economy, as millennials become more entwined in the real estate recovery and need access to mortgages and business loans. The banking sector has consolidated through attrition to some extent over the last decade; the biggest banks are likely to win the lion’s share of this new business, with Wells Fargo probably being better positioned than any other company. 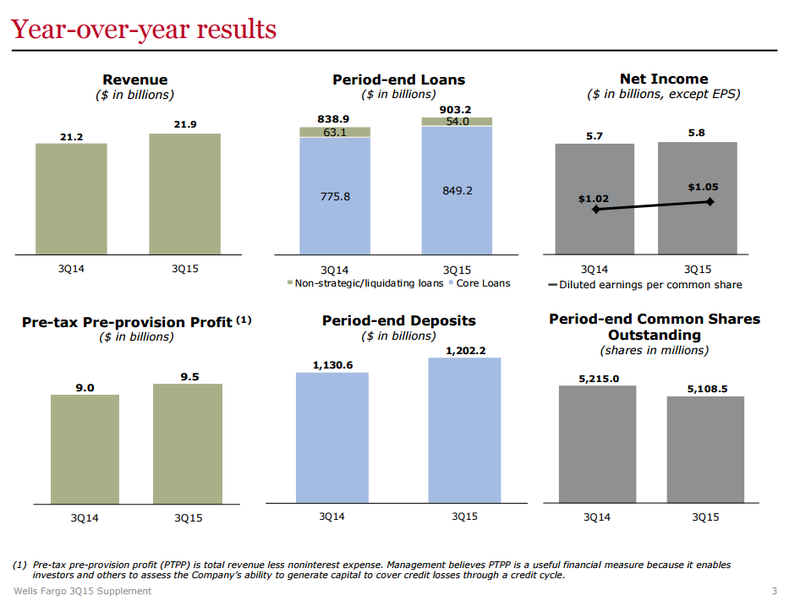 On October 14th, Wells Fargo reported a very strong 3rd quarter. 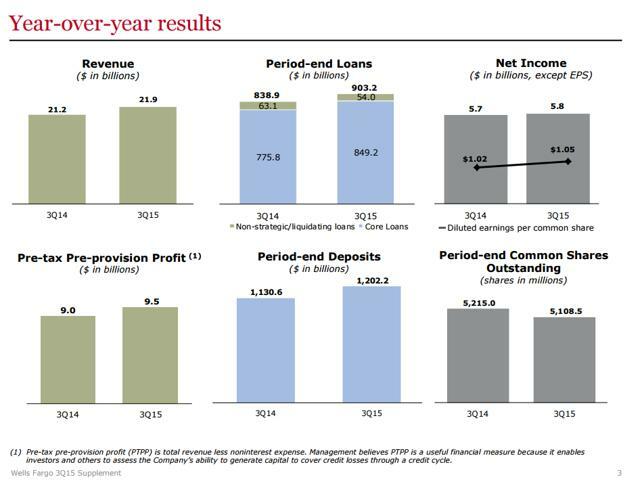 Net income of $5.8 billion was up 1% from the 3rd quarter of 2014. 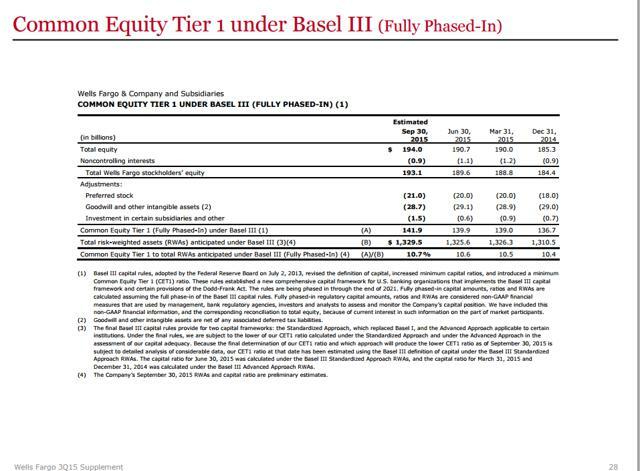 Diluted earnings per share of $1.05, were up by 3% YoY. Revenue of $21.9 billion was also up 3%. Pre-tax, pre-provision profit of $9.5 billion, was up 6%. 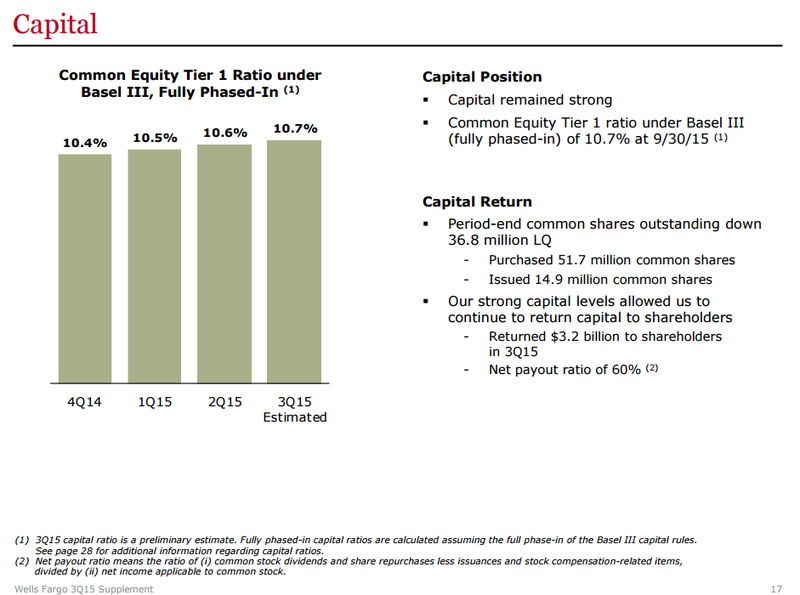 Wells Fargo’s return on assets was 1.32%, while the return on equity was 12.62% in the quarter. Wells Fargo has done better in the past but this was a very challenging quarter in terms of the economic and interest rate environment. 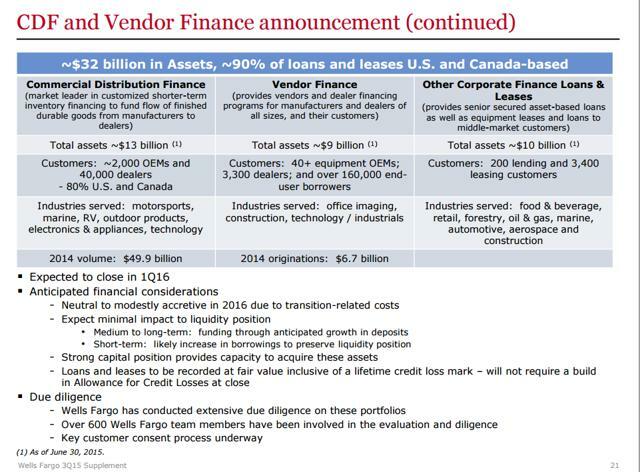 Wells Fargo saw strong loan growth with total average loans of $895.1 billion, up $61.9 billion, or 7% YoY. Quarter-end loans of $903.2 billion, were up 8%, or $64.4 billion. 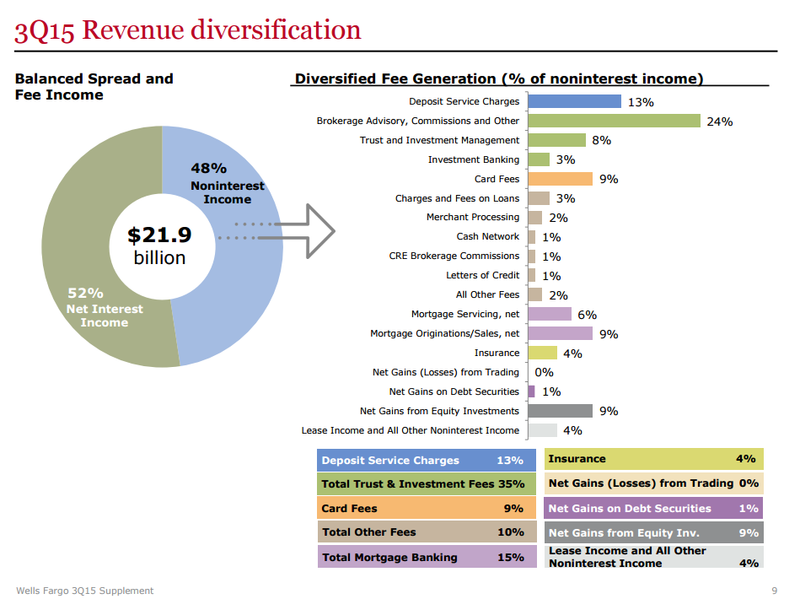 Total average deposits were up 6%, or $71.8 billion, to $1.2 trillion. Wells Fargo’s balance sheet is in exceptional shape. The net charge-off rate was 0.31%, down from 0.32% a year ago, although charge-offs were up slightly due to higher loan growth. Nonaccrual loans were down $1.8 billion, or 14%. 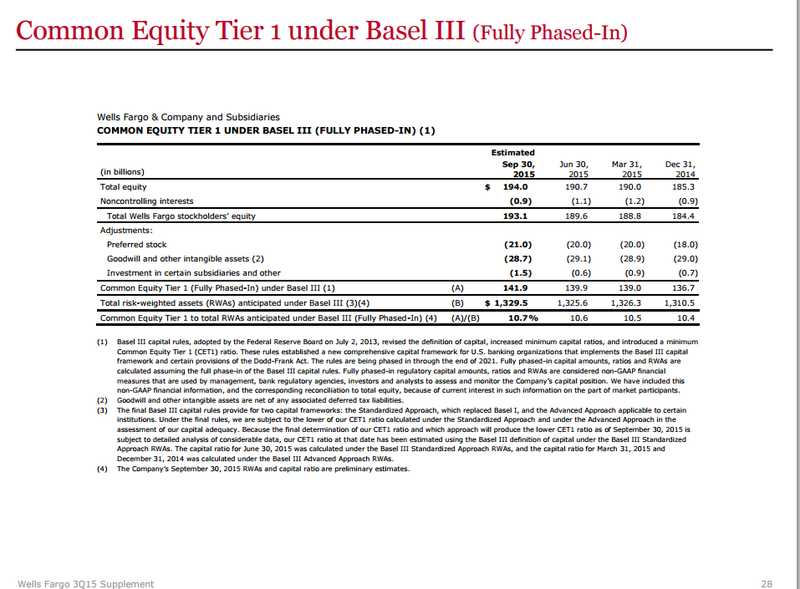 Wells Fargo’s Common Tier 1 ratio under Basel III (fully phased-in) was 10.7% at the end of the quarter. The company reduced its common shares outstanding by another 36.8MM shares from the 2nd quarter of 2015. Wells Fargo is currently paying out 60% of its income to shareholders via stock buybacks and dividends. 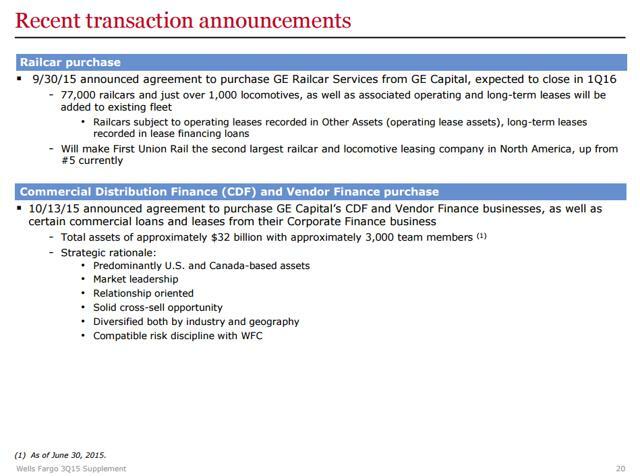 Net interest income increased by $187MM from the 2nd quarter to $11.5 billion, primarily driven by growth in investment securities and loans, including the full quarter benefit of the GE Capital loan purchase and related financing transaction. The net interest margin was 2.96%, which was down 1 basis point from the most recent quarter. Wells Fargo continues to have the best deposit franchise of all the big banks. 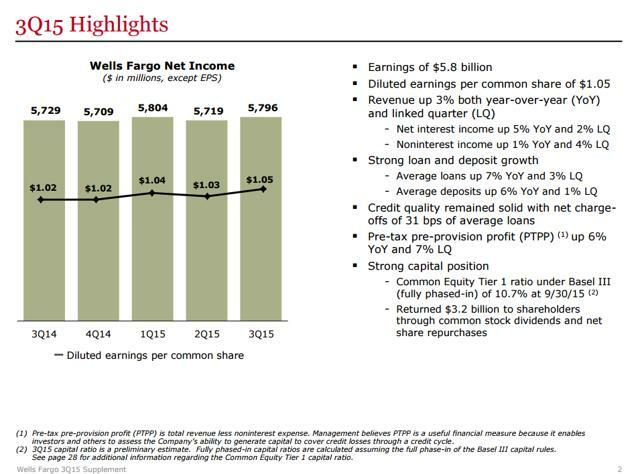 Wells Fargo’s noninterest income was $10.4 billion, which was up from $10 billion in the 2nd quarter. This was largely based on higher equity investment gains, deposit service charges, lease income and card fees. Mortgage banking noninterest income was $1.6 billion, down $116M from the 2nd quarter. 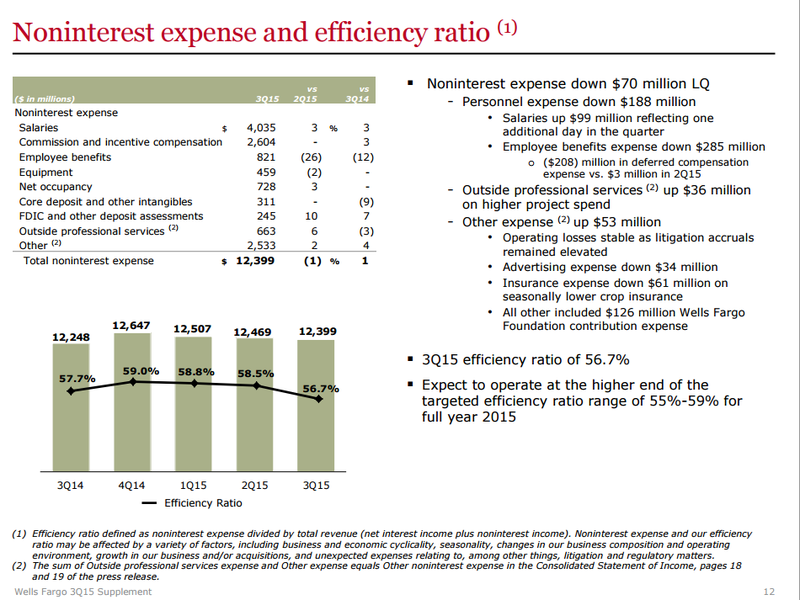 Noninterest expense declined $70M from the prior quarter, highlighting WFC’s continued ability to obtain operating leverage. Wells Fargo’s efficiency ratio improved to 56.7% in the 3rd quarter, compared with 58.5% in the 2nd quarter of this year. This was a very strong number given the interest rate environment that the company is working with. 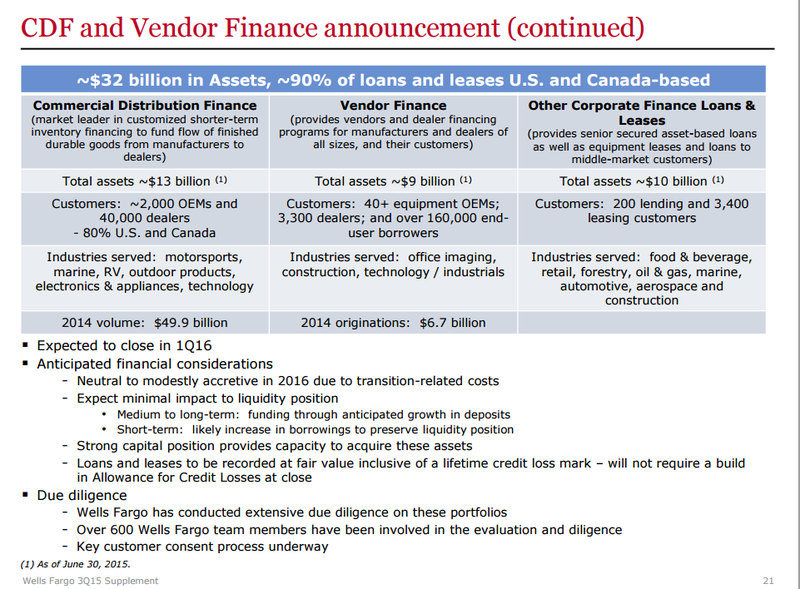 Wells Fargo has made a material improvement to its business mix with these acquisitions from GE. While GE is receiving a fair price, Wells Fargo’s culture of cross-selling will make it a much more valuable franchise than it has been before. Many people questioned whether Wachovia’s culture would fit within Wells Fargo, as I believe people will wonder about with GE as well, but it was Wells Fargo’s culture that won out to all stakeholders’ benefit. That acquisition transformed Wells Fargo and was one of the absolute steals of the Financial Crisis. Clearly, this isn’t the same type of distressed sale, but the acquisition allows the bank to grow its revenues in earnings without needing great U.S. economic growth. 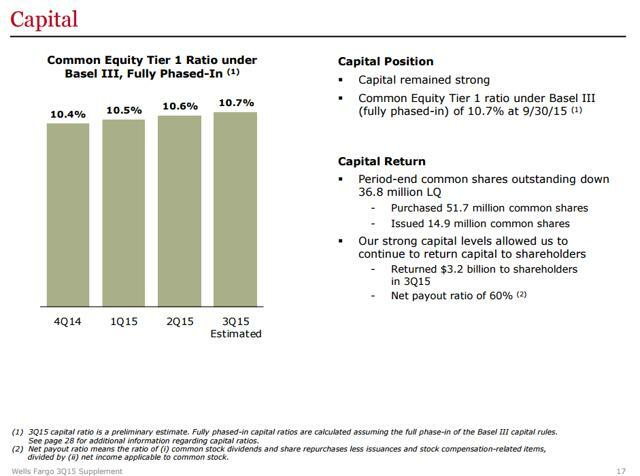 At end of the 3rd quarter, Wells Fargo’s book value stood at $33.69 per share. The company’s current earnings power is around $5, so if one is willing to put a multiple of 12 on that, you can get to the bank being worth $60 per share. I see Wells Fargo as a consistent earnings and dividend growth opportunity. It isn’t the no-brainer that some of its peers are, simply because the price is not nearly as cheap relative to intrinsic value. With that said, I believe the stock should be accumulated on dips and will lead to reasonable returns from current levels. When interest rates do go up, the whole industry could be re-rated substantially higher as there will be an obvious path towards earnings growth. I also believe that the market has underappreciated the impact that the increased capital rules have had on the business. Banks are much more utility-like, which is a compliment in that they should provide solid earnings and dividend growth for many years, without the catastrophic risks when the next severe recession hits.